Saturday has arrived once again, and you know what that means: it is time for another Digital Digest. This week, we've got all of your regular features, as well as a review of a Blu-ray release of a popular CBS crime drama, with the Blu-ray/DVD combo release of the Quintin Tarantino episode of CSI, with CSI: Crime Scene Investigation - Grave Danger. It seems like it was just last week--and that is because it was just last week--that the Tyler Perry sitcom Meet the Browns - Season Four was released. So naturally, it is already time to announce the next set, and it has indeed been announced with Meet the Browns - Season Five. The set is scheduled to be released on April 27. Lucille Ball fans will be pleased to know that MPI is set to release their final release of The Lucille Ball Specials on March 20, when they release The Lucille Ball Specials - Lucy Moves to NBC. 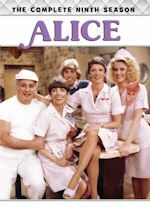 The single disc release contains Lucille Ball's last TV special, which featured guest stars such as Bob Hope, Johnny Carson, Jack Klugman, and even Gary Coleman, and as a bonus feature, you'll find a lost sitcom pilot that Lucille Ball directed for NBC in the early 80s, Bungle Abbey. We should have a review of this DVD some time next month. Next month, the classic series 21 Jump Street gets a feature film adaptation in theaters with the Columbia Pictures/MGM 21 Jump Street film starring Jonah Hill and Channing Tatum. Mill Creek Entertainment, though, the studio which released the classic series on DVD, is getting in on the action as well. On March 6, look for the value priced 21 Jump Street - 21 Classic Episodes to hit store shelves. It isn't available to order yet, but if you are really interested in the series, you may just want to skip this set and go for the 2010 release of 21 Jump Street - The Complete Series, which can be obtained for around $20 (or less). If you own an Xbox 360 and you use the popular Sony website Crackle, your experience is about to become even easier than ever before. There is now "an app for that" (to steal a term from Apple) to use Crackle on the Xbox 360, but it is made even better by the fact that it is able to respond to verbal voice commands using Xbox Kinnect. You can read more about it here. Tuesday (February 7) brings no new sitcom releases, but there are still some nice releases on the plate. First, Shout! Factory has Police Woman - The Complete Second Season, as well as Rocko's Modern Life - Season Two. We hope to have a review of Rocko soon. Also, CBS Home Entertainment has the DVD debut of Father Dowling Mysteries, with Father Dowling Mysteries - The First Season. You can see our review of this set from last week's Digital Digest. Director Quentin Tarantino brings his edgy, pulse-pounding style of filmmaking to CSI: Crime Scene Investigation in this gripping, feature-length offering from the acclaimed, top-rated crime-drama series. A reunited CSI team must race desperately against the clock when one of their own is abducted and subsequently buried alive - a diabolical plot that grows more intense and claustrophobic with each new shocking twist and heart-stopping turn. Guest stars John Saxon, Andrew Prine and Lois Chiles and cameo appearances by Tony Curtis and Frank Gorshin add to the suspense and excitement of this unforgettable CSI thriller. "Grave Danger" is the two-hour fifth season finale that aired on CBS on May 19, 2005. The thrilling story begins when CSI team member Nick Stokes is suddenly abducted and buried alive. As his team receives random demands, they are directed to a website where they are forced to helplessly watch as Stokes desperately struggles to free himself from his underground coffin. The CSI team reunites with a single mission in mind: to save one of its own. The episode has a teleplay by Naren Shankar, Anthony E. Zuiker and Carol Mendelsohn and a story by Quentin Tarantino. All of the main cast members of the fifth season are featured in the episode: William Petersen, Marg Helgenberger, Gary Dourdan, George Eads, Jorja Fox, Eric Szmanda and Robert David Hall. Guest stars include John Saxon as Walter Gordon, Andrew Prine as Judge Bill "Cisco" Stokes (Nick's father), Lois Chiles as Jillian Stokes (Nick's mother), and Tony Curtis and Frank Gorshin as themselves in cameo appearances. This was Frank Gorshin's final television appearance. He died two days before this episode aired. The standalone Blu-ray/DVD combo release comes in a standard Blu-ray case. It features a shot of George Eads in the underground coffin on the cover. William Petersen is featured on the back of the case. A short synopsis of the release and a listing of the Blu-ray/DVD specs are provided. Inside the case, Anthony Zuiker, creator of CSI provides a few words on the episode and Quentin Tarantino. The DVD has the CSI logo and a light gray background. 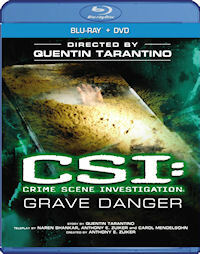 The Blu-ray release features the CSI logo and a light blue background. The menus are similar to what you see on the full season releases. They open with a montage of video clips of from the episode. 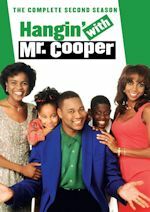 The show's theme song, Who Are You by The Who, is played in the background. It loops after about 35 seconds. There are options to play the episode, set up and the special feature on both discs. The DVD has the options on the right side of the screen, while they are on the left on the Blu-ray. When you select Set Up or Special Feature on the DVD, it takes you to a sub-menu. There are on-screen menus for Set Up and Special Feature on the Blu-ray. You can choose English 5.1 Surround or Español from the Audio Options. English for the deaf and hard of hearing and Español subtitles are available. Moving on to the video and audio, the episode looks and sounds outstanding. This is my first time seeing a CSI episode on Blu-ray. I'm very impressed with the quality. It's just a visually stunning episode with the way it was filmed. The Blu-ray is presented in 1080p high definition. The DVD is in its original widescreen 16:9 format. The episode appears to be unedited, with a running time of 1:25:14. Both the Blu-ray and DVD feature English 5.1 or Spanish Stereo tracks. This episode used quite a few songs. All of them appear to be here. There are some memorable ones like Bob Neuwirth's Lucky Too and Outside Chance by The Turtles. Chapters are placed at the appropriate places. Unfortunately, there is only a single special feature found on both the Blu-ray and DVD discs. CSI: Tarantino Style is the same 17-minute featurette that was previously included on the CSI: Crime Scene Investigation - The Complete Fifth Season DVD release. It's presented in full frame video and features lots of on-set footage. Interviews include Carol Mendelsohn, William Petersen, Quentin Tarantino, Anthony E. Zuiker, George Eads, Richard Berg, Marg Helgenberger, Robert David Hall, Gary Dourdan, John Saxon and Mark Byers. They talk about how they got Quentin Tarantino involved with the episode and how it was to shoot it. The cast shares their experiences working with him. This is a decent featurette, but it easily could have been more detailed and twice as long. Grave Danger is one of my favorite episodes of the CSI series. I only saw it once before on the night it originally aired, but it remains just as thrilling and gripping watching it now. It's just an outstanding and well crafted episode that plays like a movie. It features excellent directing, writing, acting, music and production values. Quentin Taranino received an Emmy nomination for his work on the episode. It was one of the highest rated episodes of the series with over 30 million viewers. This is a pretty lackluster release for such an entertaining episode. It was previously released as a standalone DVD and on The Complete Fifth Season. We get the same special feature on the new Blu-ray/DVD combo that was on the other set. More special features like audio commentaries or deleted scenes would have been welcome and added value to this release. I'm surprised that they didn't include a commentary on the original fifth season release, but I think it would have been easy to record one now. This set just seems overpriced for what you are getting on it. You can buy the complete fifth season on DVD for only a few dollars more. A "best of" Blu-ray release of 8-10 episodes would be much more popular and have better value. Only the first and ninth seasons have been released on Blu-ray in the U.S., so it would be great to see more seasons released in the future, especially the early years when the show was at its best. 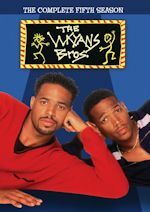 Wave Theme Songs (www.wavethemes.org) - It isn't really necessary to say a whole lot about this website, because it isn't a site that brings a full range of everything TV related. In fact, it only focuses on one thing: theme songs. But that focus on theme songs is what makes this website so great. 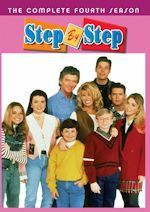 The website is one of, if not THE, most complete databases of theme songs that you'll find on the internet. In fact, there are literally THOUSANDS (no joke) of theme songs that can be downloaded from this website, in a compressed form, and then opened and played in WAV format. The site doesn't get updated quite as often as it did in its heyday (the last listed update was in summer 2011), but it is not abandoned by any means. So if you are every trying to find an audio file of almost any theme song, this is definitely the place to go, and that is why it is our Click of the Week.